Are Hershey’s Sugar Free Products Healthy? Leave a Comment on Are Hershey’s Sugar Free Products Healthy? “Get your favourite sweets without the guilt” they say… but chocolate syrup is for pleasure seekers, indulgence masters and synthetic sopranos. Why replace something unhealthy with something still very unhealthy just for a little less guilt, and a lot more sugar cravings? Hershey Chocolate Co. has sugar-free products as far as the eye can see. From sugar-free Twizzlers, to sugar-free Reese’s pieces, to sugar-free chocolate syrup, it all seems a little too good to be true, and with ten products within the Hershey range stating their ‘lower calorie’ ‘better-for-you’ versions it seems most health-conscious consumers are likely to reach for these over their original full-fat types. Typically, when a product is sugar-free and purports to contain 20% fewer calories than its original counterpart, there’s almost always something just as bad waiting in the sugar-free product to trip up any health benefit. Can you beat a “Classic”? In Hershey’s Sugar-Free Chocolate Syrup, for instance, you’ll find a completely different ingredients list from the original. The original syrup’s first 5 ingredients are High Fructose Corn Syrup, Corn Syrup, Water, Cocoa Sugar, and Potassium Sorbate. In the sugar-free syrup the first 5 ingredients are Water, Cocoa processed with alkali, Glycerin, Sodium Acid Sulphate, and Xantham Gum. Besides the water, you wouldn’t know they were in any way related. And that’s because a ‘sugar-free version’ could never simply by a case of removing the sugar from the original product, or else that would be too easy – everybody would buy the sugar-free version, the original product would fall to the wayside, and everyone would get skinnier overnight. No, to make a product sugar-free, there’s a whole load more shuffle-work which needs to be done… and that starts with adding more chemicals and preservatives. The sugar-free chocolate syrup has 17 ingredients, whilst the original syrup has 11 (although this is still a hefty amount by any manufacturer’s standards!). These chemicals include sugar alcohols Erithritol, Maltitol and Glycerol, which act as sweeteners with fewer calories than table sugar. When their nutritional properties are put side-by-side, the sugar-free syrup does have fewer calories and carbohydrates, but it has far more sodium to bulk it out and give it a richer taste than simply flavourless chemicals, and contains just as much (or as little) dietary fibre as the original. The problem with sweeteners (when you’re going for a sugary product) is that it never lives up to its rich satiation levels of sugar. Maltitol, for instance, has 75-90% of the sweetness of table sugar and Erythritol is only 60-70% as sweet as table sugar. Sugar alcohols can also come in at 95% fewer calories per gram when compared with table sugar and other carbohydrates. The overwhelming problem with this is that these sugar alcohols look and behave the same way in the body as regular sugar. So when your body receives only a small amount of sugar into the bloodstream, your brain and your body question where the rest of the sugar is, and when it will come, and this is why you’re likely to crave more sugar after consuming sweeteners, as opposed to it quenching the desire for sweet. Sugar alcohols are also prone to causing digestive issues. With many chemical compounds knocking around in the small intestine, the body can’t cope a lot of the time and sends some of these sugar alcohols to the large intestine to metabolise fully. Food shouldn’t be broken down in the large intestine (the small intestine happily sends your digestive food into your bloodstream, the large intestine is more stubborn), and it is here where bloating and constipation can ensue. You wouldn’t choose a fake Louis Vuitton purse, would you? Overall, I think that if you’re going to go for something sugary like a chocolate syrup, you’re most likely going to enjoy the original version, if not only for its richer taste, but its more satisfying properties all round. It’s sort of like comparing a juice box to a Martini… which would you prefer? In an instance where you might have a juice box because you need something to throw down your crumbly sandwich with, a Martini is there to be savoured and is to be associated with relaxing bar evenings with posh canapés and more Martinis. This is much the same for the Original Hershey’s Chocolate Syrup vs. the Sugar-free version… you’re likely to throw chocolate syrup not on an apple, but on ice-cream. You’re going to douse it over starchy pancakes, not your healthy porridge. 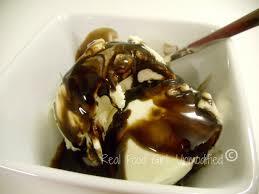 Chocolate syrup is a lifestyle choice made by the ‘treat eaters’. A sugar-free version just doesn’t cut the mustard, I’m afraid, if what you’re looking for is a sickly sweet syrup to drown in. That’s why I’m proud to say, as a British woman, that Cadbury haven’t even dipped a toe in the sugar-free pool – they know what we want as chocolate eaters, and that’s complete chocolatey indulgent joy. Health conscious consumers will have to stick to the fruit & veg aisles for their kind of stuff.